You are, without a shadow of a doubt, sick to death of hearing about the cabin (or 'potting shed' as I believe it has been referred to on here before) in which Justin Vernon recorded his hard-to-avoid album For Emma, Forever Ago. Thankfully, though, even the PR machine has realised that one went a little too far by now. Recent broadsheet darling Justin Vernon probably never thought he'd find himself in the ear of precocious corporate finance professionals on the Tube with their bright white earphones and stripy scarf's tied in a 'Parisian Knot'. Yet fortunately for them, the hauntingly absent tunes found on For Emma, Forever Ago may indeed provide a perfect match to that long walk to the dole office this winter. The good news is Bon Iver manage to keep this air of isolation, of oneness, that makes their sound so urgently effective across the Blood Bank EP. Made up of four songs recorded between December 2006 and June 2008, the decision to release this EP (made up of what detractors will surely label offcuts) so soon could denigrate what ought to go down as a seminal American album of our time. Understandably, the title track is by far and away the most immediately memorable offering. Rooted in prose that paints an original and vivid scene ("Well I met you at the blood bank, we were looking at the bags, wondering if any of the colours matched any of the names we knew on the tags") its dense, minor-chord, hollow electric strums are reminiscent of Springsteen after absent mindedly consuming one too many tranquilisers, as Bon Iver (the band) back it up with their distinctive layered vocals. Whilst discussing haemoglobin count with some young lady down the local clinic wouldn't appear the most obvious of romantic settings, Vernon manages to weave a poetically mysterious locale into 'Blood Bank's subject matter and, unlike the fragmentary lyrics found on For Emma, the story builds like the snow slowly enshrouding a trapped survivor beneath its arctic quilt. 'Beach Baby', a stripped nice little folker with leering falsetto and resonator embodies the same isolated air found on the long-player, before the genteel 'Babys' builds and builds on the repeated monotony of its piano line before flourishing into restrained bloom as Vernon states "but my woman and I know what we're for", thereafter settling back on its path of tinkling ivory. Closer 'Woods', an acapella that employs heavy auto-tune, nears the five-minute mark and provides evidence of an artist who is not only confident with the voice he has discovered within himself but also one who is willing to invent and experiment. A good sign. 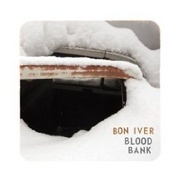 While this release doesn't add a significantly new string to the Bon Iver bow (it's as sparse as the bleak winter landscape so inspires Vernon) Blood Bank does provide an experimentally varied stepping-stone to that all-important sophomore release, and in doing so, most crucially does absolutely nothing to stain the legacy of its predecessor.